Loved the price. For me im single but u always pay a double occupancy price and for once i didnt feel cheated. Where to find Martinsville hotels near an airport? Where can I find hotels in Martinsville that are near tourist attractions? 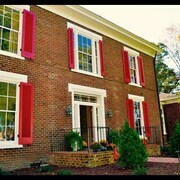 Hoping to find accommodation options in Southern Virginia, particularly in the Martinsville area? 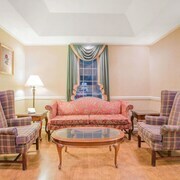 Downtown Martinsville offers 9 Expedia-recommended accommodations within a 0.1-kilometre (0.06-mile) distance. You'll find Baymont Inn And Suites Martinsville and Super 8 Martinsville VA within a short walk from Martinsville's center. Collinsville is a neighborhood that is 5 kilometres (3 miles) from the middle of Martinsville and offers 2 hotels. The Quality Inn Dutch Inn and Knights Inn Collinsville Va are amongst the Expedia-listed hotels in Collinsville. Martinsville features only a handful of budget accommodation options. You'll find the Econo Lodge Martinsville conveniently located 3 kilometres (2 miles) from the center of town. You could try the Hampton Inn Martinsville and also the Econo Lodge. 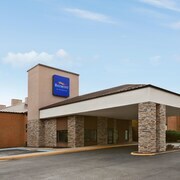 The Hampton Inn Martinsville can be found 4 kilometres (2 miles) away from the main part of Martinsville. The Econo Lodge, is situated 25 kilometres (16 miles) away. Alternative hotels and apartment options include the Shayona Inn Eden and the Hampton Inn Eden. The nearest accommodation options in Southern Virginia include Danville and Collinsville. Danville is 45 kilometres (28 miles) to the east of Martinsville, while Collinsville is 5 kilometres (3 miles) to the northwest. 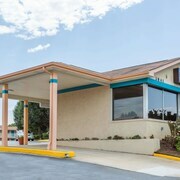 Danville accommodations are the Courtyard by Marriott Danville and Hampton Inn Danville. 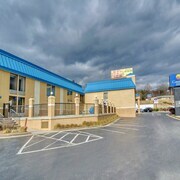 While Collinsville hotels are the Comfort Inn Martinsville and Deluxe Inn Martinsville. If enjoying sport is what you love, make sure you visit Greensboro Coliseum, which is 70 kilometres (44 miles) to the south of Martinsville. For travelers who are interested in booking accommodation nearby, make a reservation in the Proximity Hotel or O.Henry Hotel. For those travelers planning on arriving or departing via Piedmont Triad International Airport, you may like to book a room at Homewood Suites by Hilton Greensboro Airport, or Embassy Suites Greensboro Airport, which are both close. What are the most popular Martinsville hotels? Are there hotels in other cities near Martinsville? What other types of accommodations are available in Martinsville? Explore Martinsville with Expedia.ca’s Travel Guides to find the best flights, cars, holiday packages and more!